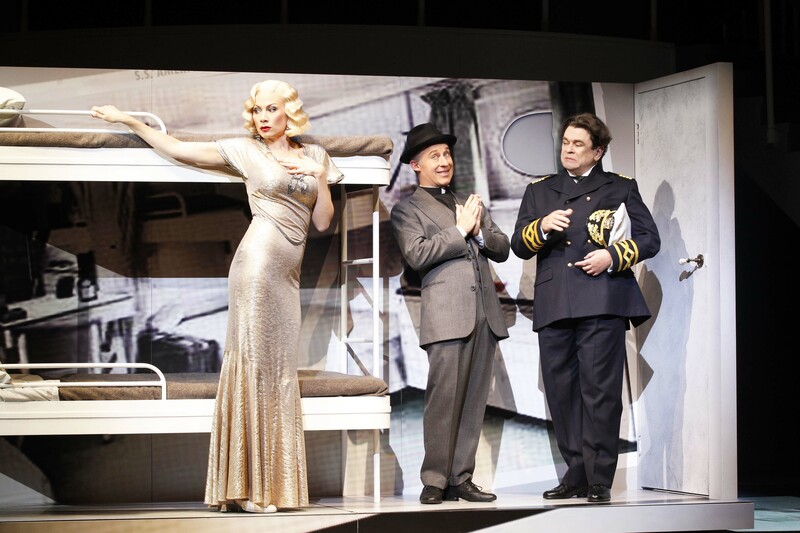 Everything old is new again as a sensational cast brings daffy delight Anything Goes roaring back to life. Director Dean Bryant and choreographer Andrew Hallsworth are in peak form, treating the material with the utmost respect and enhancing it with a multitude of witty, intelligent, creative choices. Even those who know the material back to front and inside out will laugh out loud and tap their toes all over again. The glittering jewel in this cast of triple threats is living kewpie doll Caroline O’Connor, giving a performance that is set to be worshipped for the weeks ahead and talked about for years to come. An ageless, tireless trouper, O’Connor belts out the score with supreme power, dances with more energy and elasticity than youngsters half her age, and sprinkles delectable comic pizazz through her every song and scene. O’Connor enjoys zinging chemistry with three terrific leading men. In a high profile role that is long overdue, Alex Rathgeber has charm to spare as love-struck Wall Street broker Billy Crocker. Hits like “Easy to Love” and “All Through The Night” show off Rathgeber’s smooth, supple tenor, and he equally impresses in comic scenes and dance numbers. Surely the first portrayer of Lord Evelyn Oakleigh to be given star billing, Todd McKenney gives a nicely controlled performance that lets the buffoonery of the culture-struck character shine through. While O’Connor’s duets with Rathgeber (the infectious “You’re The Top”) and McKenney (the outlandish “The Gypsy In Me”) each shine, the standout comic duet of the night comes when O’Connor teams up with fellow hoofer and Vaudevillian-style comedian Wayne Scott Kermond for “Friendship.” Kermond does not really give an indication of the actual gangster side of Moonface Martin, but the physical and verbal comedy are right up his alley. As debutante Hope Harcourt, Claire Lyon’s gorgeous soprano is a pleasure to hear. Lyon looks divine in blonde marcel wave and form-fitting 1930s fashions, but rather than just look pretty, Lyon adds some engaging backbone to a role that is often played as an insipid wallflower. Carmen Duncan bring a touch of grace as Hope’s mother Evangeline Harcourt. Bartholomew John plays Elisha Whitney with stoic dignity. Hallsworth peppers the duets with all manner of sight gags, but his accomplishments are the incredible showstoppers. 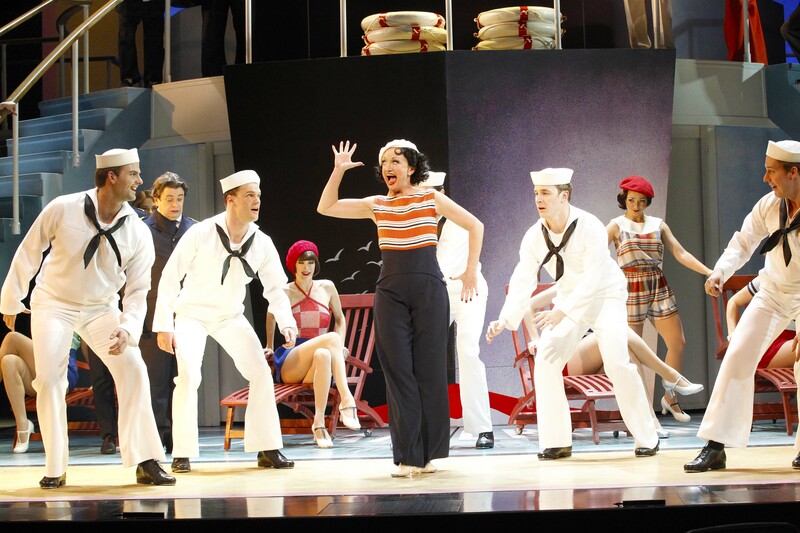 Well-known tap number “Anything Goes” builds and builds as Reno progressively infects her shipmates with the joy of dance. A bit of a master with props, Hallsworth makes great use of life preservers in the spectacular routine. The hypnotic energy of “Blow Gabriel, Blow” is sensational, and contains a brilliant touch where Reno grabs Evelyn and selflessly pushes Billy to Hope, giving both pairs an extra chance to connect and develop. Hallsworth and team have also added an extra encore after the bows, which leaves the crowd on an even greater high. Bryant focuses the energy and talents of the lively cast into outsized, but well-controlled, comedy and clear, character-driven storytelling. 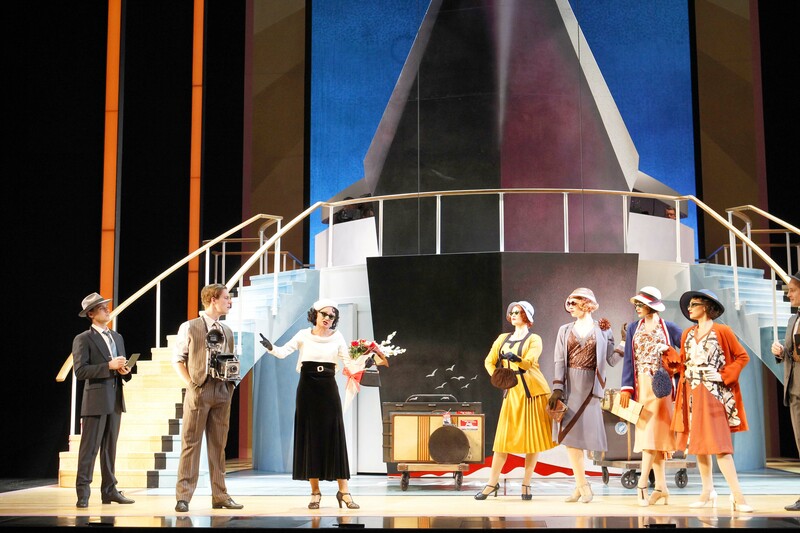 Where Bryant’s direction of Anything Goes for The Production Company was undermined by the vast width of the State Theatre stage, here the action is punchy and the comic timing is snappy. Music Director Peter Casey leads 16 on-stage musicians who deliver plenty of zing and sparkle to Cole Porter’s classic score. Sound design by Michael Waters is excellent, with vocals and music well balanced and every punchline heard with clarity. Lighting designer Matt Scott paints the space with vivid colour in “Blow Gabriel, Blow,” with another attractive effect coming in “It’s De-Lovely” when Billy and Hope dance in rosy pink light while the other couples are in steely blue. In contrast with the splashier, glossier costumes of the 1988 Australian production, Dale Ferguson’s costumes are equally attractive, but have a more realistic edge. Highlights include Hope’s stunning gold-laced wedding gown, Erma’s shimmering, floor length silver gown, and the female chorus’ colourful, attractive daywear. 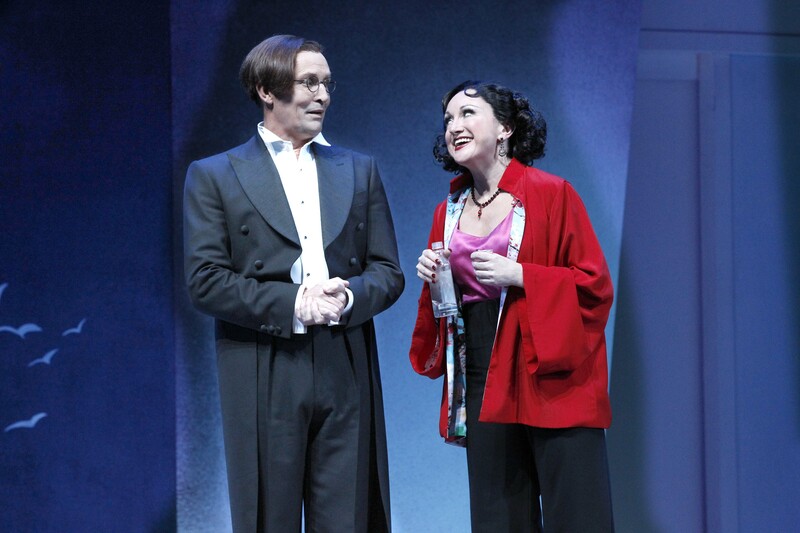 And there is always an extra touch of class when the leading lady has a fresh outfit for the curtain calls. The uninspired scenic design is attributed to Ferguson as “Set Adaptation,” and it is assumed that there was little scope, or budget, for him to adapt this in any sort of appealing, attractive or interesting way. While effective use is made of the rotating unit that slides in from under the band’s platform, the general stairs, railings and platforms are very plain, without a trace of art deco. The placement of the imposing bow of the ship (waves, seagulls and all) upstage behind the action is quite inexplicable. 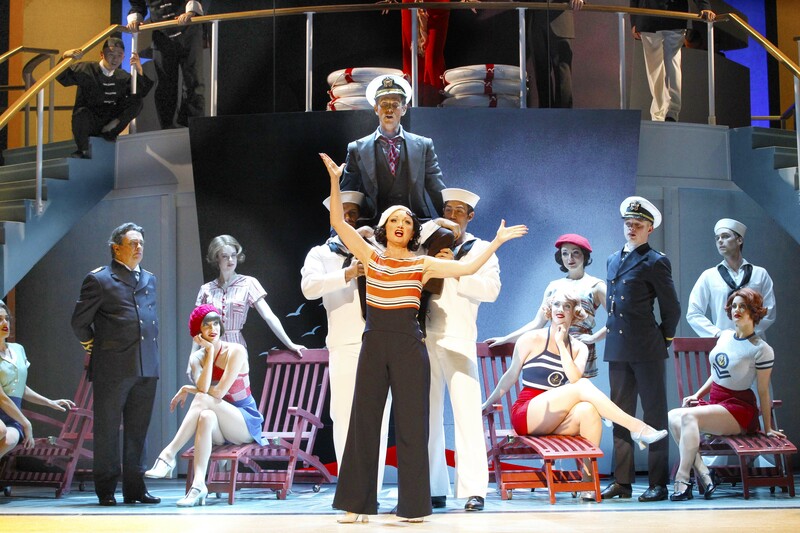 Cast, choreography and costumes are three compelling reasons not to miss Anything Goes. 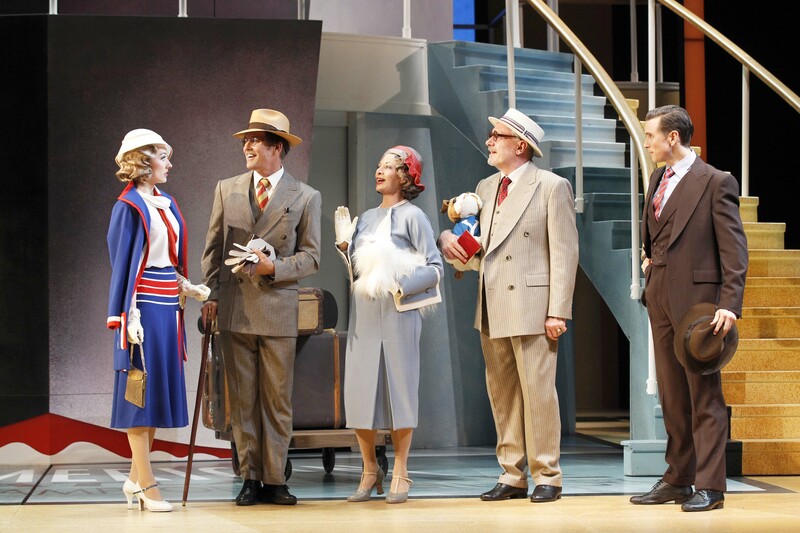 Anything Goes plays at Princess Theatre, Melbourne until 19 July 2015 before touring to Brisbane and Sydney. Me mum (85 years young and in early stage dementia) and I went this afternoon. A wonderful time: great singing, brilliant dancing, wonderful acting, exquisite costuming. I saw the 1989 production, but don’t remember it as being as gorgeously, joyously comedic as this.